and surrounding Southeast Volusia County. Please see delivery charges on our Products Page. We will make every effort to deliver on the date and time indicated when you place your order. If you need to change or cancel your order, we ask that you contact us at least 2 hours prior to your scheduled time. Please take the time to look at our products and ask questions to be certain you are getting the materials you require. We are always happy to assist you. You have the right to inspect the load when it arrives. 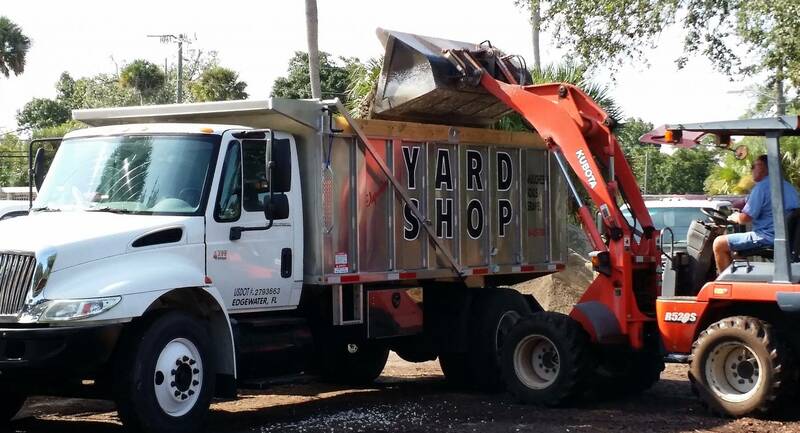 Please address any concerns to the driver before he unloads the material so that the issue can be resolved promptly. Once the material is off-loaded, full payment will be required. If the delivery is refused, you may be required to pay the delivery charge. Special order products cannot be returned, exchanged or refunded. If the delivery site is unattended, we cannot be responsible for any loss or damage to products after we leave, or for incorrect placement of products on the site. When an order is not paid for in advance, it will not be off-loaded at an unattended site, and an additional delivery charge will be added to the invoice if we are asked to return. Our responsibility ceases at the curbside. If you ask us to enter upon your property, it will be done so at your own risk. We will not be liable for damage to driveways, sidewalks, lawns, sprinklers, etc., as a result of the truck being too heavy. Our driver reserves the right to refuse to enter an area that he determines unsuitable or unsafe. We will NOT enter your neighbor’s property to gain access to yours. • No refunds or returns on bulk, baled or special order materials. • Exchanges/Returns on bagged products must be made within 3 business days and are subject to our discretion. • Returns are subject to a 10% restocking fee.